Problem Management is the process that helps you manage the lifecycle of all problems that happen or could happen in an IT service. The ITIL library defines a problem as the cause of one or more incidents. The main purpose of problem management process is to prevent problems and the resulting incidents from happening, also to limit or stop the recurring incidents caused due to same problem, and to minimise the impact of incidents that cannot be prevented. Problem Management maintains the information about problems and the appropriate workarounds and resolutions. 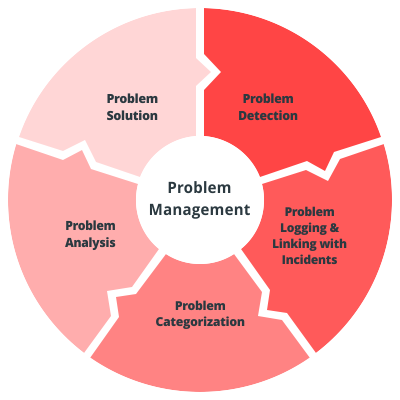 Through the Incident Management process the root cause of incidents is identified and further the root cause is diagnosed using Problem Management system to find the actual cause of problem. Further, the resolution to those problems is implemented through the appropriate control procedures, especially Change Management and Release Management. Even if incident has been resolved but definitive cause must be found in order to avoid reoccurrence. Once the problem is detected its logged in service desk with its due time, status, priority, risk and more. Categorize problem department, status and priority wise. Finding the root cause, impact and symptoms of a problem. A workaround or a final solution has to be provided to a problem. Attach CI to a problem and keep track of CIs affected. Attach or link problem with incidents. Jump to and fro between incident and problems. 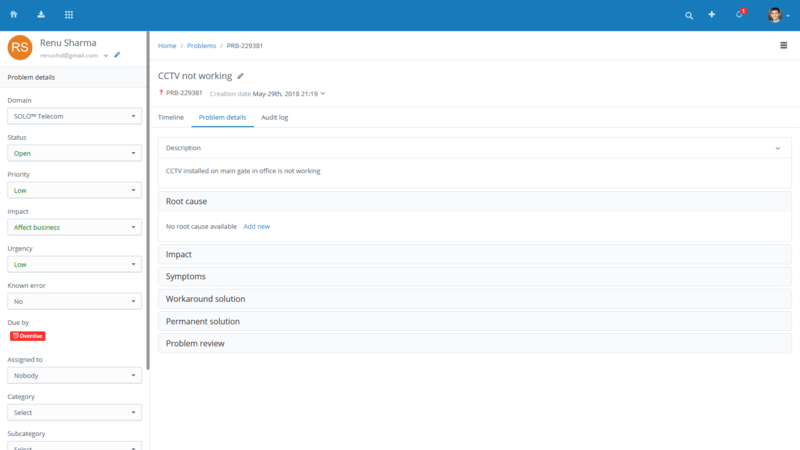 Link all incidents to specified problem and with problem resolution update to incidents.